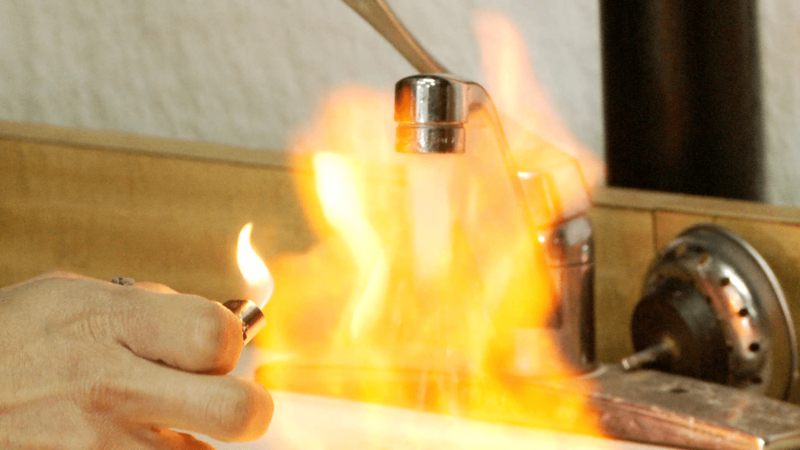 Just watched Gasland, the chilling documentary by Josh Fox, about the horrific environmental and health damage being caused by ‘clean’ natural gas wells across the country. The film is a must see for every citizen of the world (or maybe just the USA) who cares about the balance of power between corporations and individual, and clean water and air. But we never should have gotten to this point of deregulation and malfeasance by the oil & gas energy industry to be killing people and destroying the adjacent habitats. As citizens, it is imperative that we contact our representatives about S. 1215 & H.R. 2766 the Fracturing Responsibility and Awareness of Chemicals (FRAC) Act, to stop the unregulated pollution of our air and water by the oil and gas industry. The BP leak in the Gulf is a fraction of the toxic releases everyday in the production of natural gas across the nation. via mindfully and written by Stephanie Mills for the defunct Clamor Magazine, i.18, Jan/Feb 03. Old news, but worth sharing as a reflection of what I’m thinking about this summer. Does it preserve or reduce cultural biodiversity? What is the totality of its effects—it’s “ecology”? How does it affect our way of scene and experiencing the world? Does it serve to commodify knowledge or relationships? Does it to raise a sense of time and history? I found a copy of the Tomar Electronics Strobecom II System Manual [pdf] on the sidewalk while walking through my hood last week. As a belated contribution to m.ammoth’s reading the Infrastructural City and discussion about ‘Traffic’, I though it would be worth sharing some excerpts about this disruptive technology that is invading our traffic intersections. So what is the Strobecom II? What they don’t specify, is if the frequency is a color of light or the intervals of the flashing light in the emitter. Of course municipalities and agencies want to limit the deployment of this technology and the availability for baddies and regular Joes hijacking traffic lights to their own advantage. Yes, there even was a Numb3rs episode that revolved around catching a vigilante who was doing this. So you don’t need to hack into the traffic light control system like they ‘did’ in the Italian Job to gain superpowers over traffic jams – you just need a Strobecom II emitter! The magnitude of the oil spill in the Gulf of Mexico should be a catalyst for changing how we impact the environment and our use of oil. Here are a few of the needed steps we MUST try if we are to kick our addiction to oil and mitigate the ecological damage the oil is causing. We can mitigate some of the damage of the oil plumes by dealing with the Gulf dead zone caused by the runoff of fertilizers into the Mississippi River. Fixing the dead zone is easier and cheaper then cleaning up the oil. Yeah, the farm lobby will howl, but the fix is simple and cheap – vegetated buffers on all tributaries to the Mississippi can significantly cut nutrient loading. Viola! no more hypoxia in gulf due to farm/lawn runoff. Okay, urban runoff is also a problem, but not the same order of magnitude. These wetlands are the nursery of the ecological abundance of the gulf, and protect the shore from storms. Their loss has been caused by a wide range of human activities including the channelization of the Mississippi & the loss of getting new sediment, the creation of canals for oil and gas exploitation and transportation, and pollution. The easy fixes are to close obsolete channels like the MRGO to prevent currents from eroding the fragile wetland soils. Removing levees and floodwalls brings a range of risks and is controversial. Rebuilding wetlands is complex and costly. This requires lots of sediments and soil to be dredged and deposited where needed. Then the plants must be established (if the conditions are right). 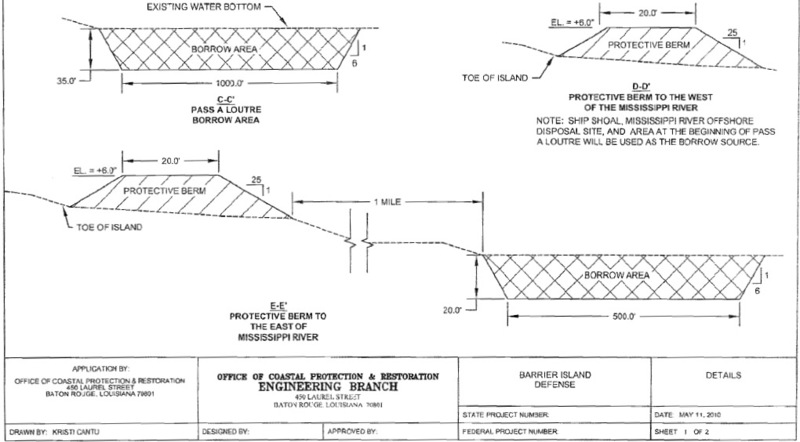 The oil protection artificial barrier islands should be more then engineered berms! With the partial approval to create of new islands to block the onshore flow of oil, these islands must also be part of the mitigation and restoration effort and not just a wall of sand to be contaminated and disposed of. I’m not advocating for a Dubai-esque extravaganza where the ‘island’ is shaped like the continents or a palm tree. But these islands and berms need to be designed such that it increases habitat area for shore birds, marine mammals, turtles, fish, and aquatic vegetation. Theses new barrier islands (which could be 45 miles long if all segments are built) should be integrated into the wetland restoration efforts once the leaking well is plugged. The US Fish and Wildlife Service and several other agencies have similar opinions in the permitting process [pdf], but the implementation documents don’t seem to be heeding this advice. 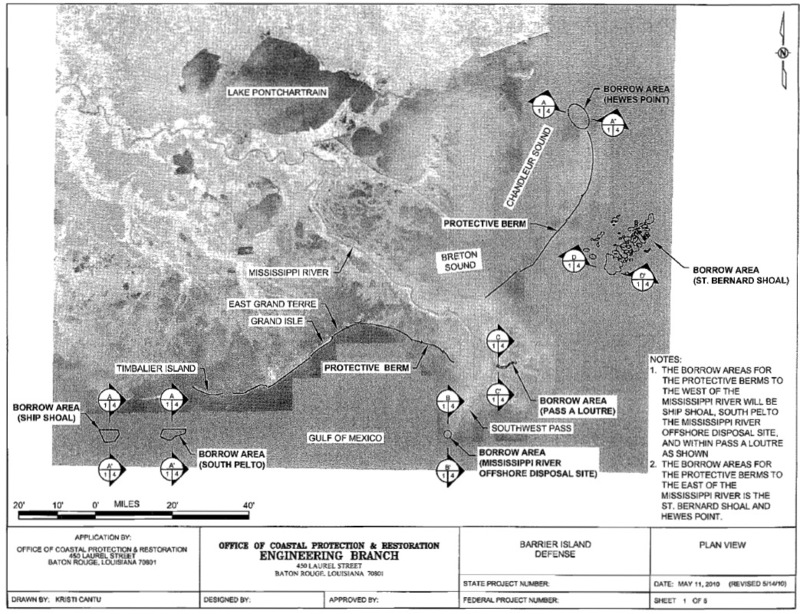 For the ACE and other agencies, this is an amazing fast approval of the permits to dredge the what ever part of the ’92 million cubic yards of material over a six to nine month period to build temporary barrier islands’ that was approved. I’ll have to spend more time parsing the permit to figure out what was actually permitted, and if it truly will be $350m to $950m.